How to configure all these network settings? Well! It can be configured manually or automatically with helps from DHCP server. 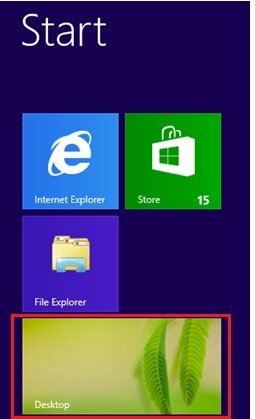 2) Right click the network icon on lower right corner of task bar area and click on Open Network and Sharing Center. 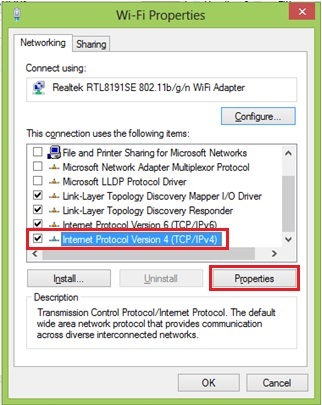 3) Once Network and Sharing Center appears, continue to click Change adapter settings. 4) Ok, if there are wireless and wired adapters installed on your computer, you will be shown a list of network connections that includes your wireless (Wi-Fi) and wired (Ethernet) connections. 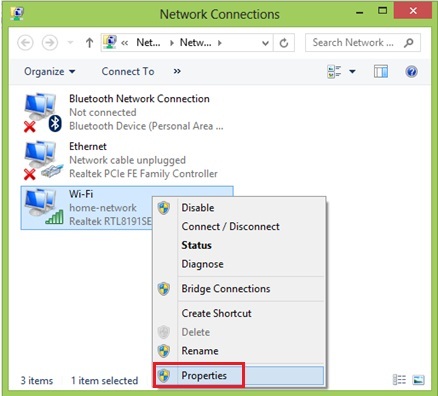 Right click the connection you would like to change its network settings, and click on Properties. In this case, I right click my Wi-Fi connection and click on Properties. Note: If your computer is connected to IPv6 network, you can select Internet Protocol Version 6 (TCP/IPv6) to configure IPv6 address, but it’s not covered here. 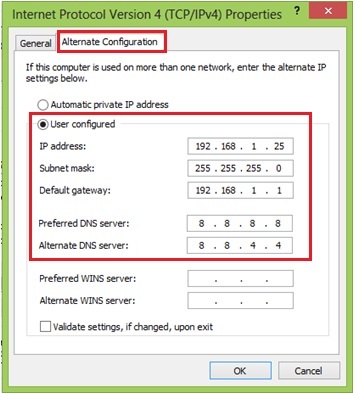 If you like to do manual network configuration, you can now key in the IP address, Subnet mask, Default gateway and DNS servers. Please bear in mind that IP address of your computer must be unique, because none of the 2 computers in the same network can share same IP address that will trigger IP address conflict problem. Note: Default gateway is a router that can route the traffic to the other network or Internet, usually it’s LAN IP address of your home router. DNS server is an application server that can translate URL to IP address, so that you could browse websites without problem. Check with your ISP on which DNS servers you should use. If not, you can try these free Opendns or Google DNS servers. 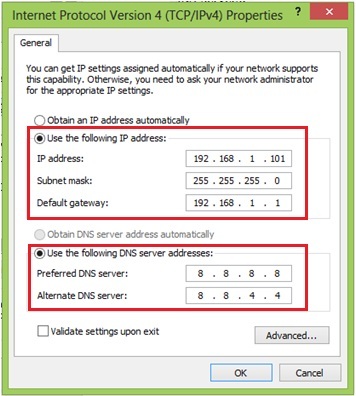 If you have DHCP server configured on your router or you have dedicated DHCP server, you can configure your computer to get IP address and other network information automatically by selecting Obtain an IP address automatically and Obtain DNS server address automatically. Note: If you have a laptop and use it at home and office, and it uses static IP at home and the IP assigned by DHCP server at the office, you can make use of alternate configuration to set IP address and network information for these 2 different networks. 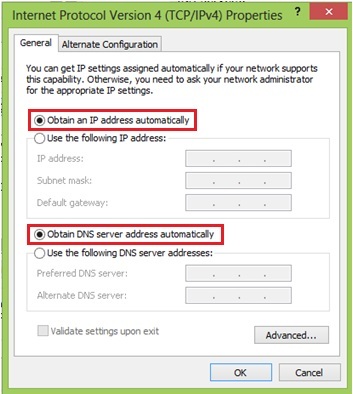 First, set Obtain an IP address and DNS automatically on General tab as according to what I specified above, so that the laptop will be assigned IP addresses automatically at the office. After that, click Alternate Configuration tab, select User configured option and key in your home network’s static IP and other network information. By setting this, when there is no IP information assigned due to no DHCP server at home, this alternate configuration will be applied automatically, so that you don’t have to spend time on configuring IP manually every time at home. That's it for Windows 8 IP address configuration. Return to top of "Windows 8 IP Address Configuration"! !